This establishment presents diners with visions of China in its innovative yet traditional dishes. The Peninsula Bangkok is proud to introduce a 16-course Degustation Menu to delight the senses at Mei Jiang. Featuring 16 dishes personally created by the hotel’s new Chinese Cuisine Executive Chef Ball Yau, Mei Jiang’s Degustation Menu is the first of its kind for a Chinese restaurant in Thailand. Each of the 16 hand-crafted dishes is presented in a tasting portion enabling diners to enjoy the expressive range and quality of Chef Yau’s Cantonese cooking. A special tea-pairing option is also offered. Signature highlights of the Degustation Menu at Mei Jiang include Pumpkin with homemade preserved plum sauce and Stir-fried Phuket Lobster with egg white, crab coral and green asparagus. 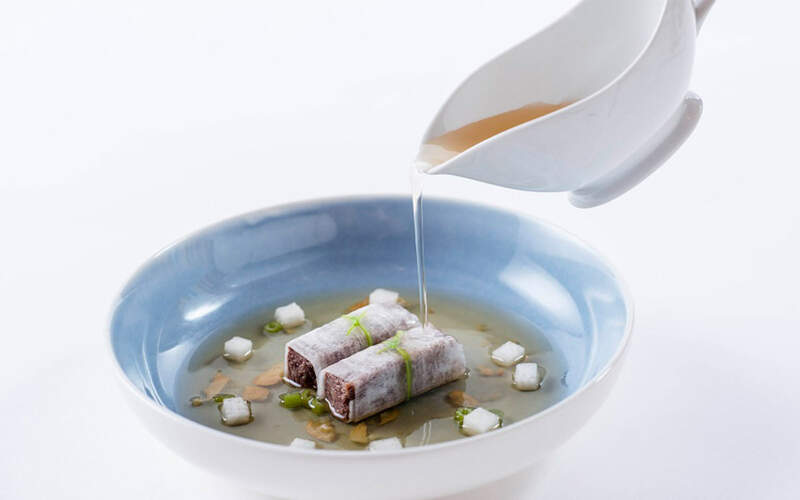 You will also experience an exemplary Braised M6 Wagyu beef brisket rolls with turnip in beef soup, Sweet and sour crispy Carabineros blending fine Asian and Spanish ingredients and Chef Yau’s own twist to a traditional Cantonese dessert of Pumpkin coconut cream with bird nest. As an alternative to the 16-course Degustation Menu, diners at Mei Jiang can select each of Chef Yau’s special dishes from the à la carte menu, alongside authentic Cantonese delights and Mei Jiang popular favourites, such as Peking Duck, Deep-fried fillet of snow fish with homemade dried shrimp and chilli salt and clay pot fried prawns in port wine sauce. Chef Yau’s Degustation menu is priced at THB 4,900++ per person and tea pairing is at THB 888++ per person (subject to 10% service charge and applicable tax). For reservations, please call or email The Peninsula Bangkok using the contact details shown or click on the button.